As of 11:30am Pacific / 2:30pm Eastern / 7:30pm UK / 8:30pm CET on 1st August, there are still some places available in our NL For Glory 01 and #FANFIGHTER01AUG Tourneys, with details below. 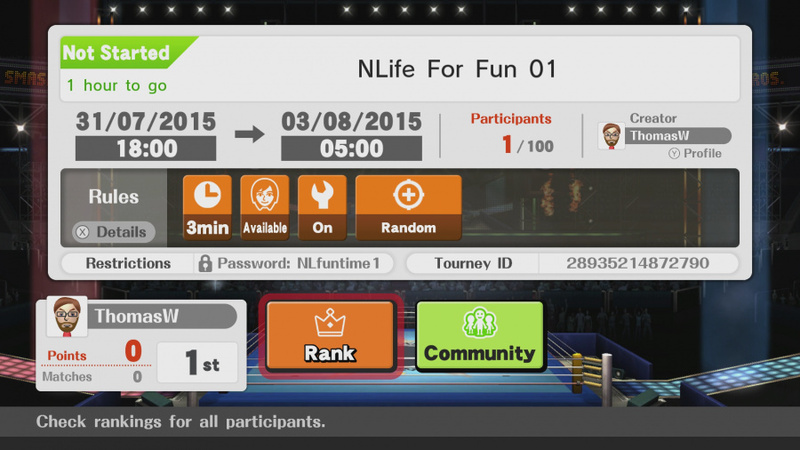 Sorry, NLife For Fun 01 is full up! The big Super Smash Bros. version 1.1.0 update is here, and in addition to DLC outfits and stages the Wii U version has two key new features. One is the option to upload replays directly to YouTube, which is fine, but the high profile addition is the online Tourney Mode. We've already produced our guide to getting the most out of Tourneys, though the reaction to the functionality on offer has been mixed. There's frustration at what's not included in particular, but nevertheless we're still going to run some Tourneys for you, our lovely community. We've set up two competitions that, within the limitations of the mode - nope, we can't arrange 1v1 - hopefully cater to different audiences. One event is running all weekend and is basically a chance for everyone to jump on for some silly fun, and the other will be more focused for those that want to prove their skills. In both cases it's first-come-first-served up to the 100 player max, and each will have a password so that those entering are most likely to be part of the NLife community. Tourney Goal - This is just for some light hearted silly fun. Rules - Points based, no limits on number of matches, 3 minute time-based. All stages and items included, Mii Fighters and Customisations allowed. Tourney Goal - This is a limited-time tournament, with stages and rules picked for competitive action. Unfortunately 1v1 isn't possible, but outside of that we've done our best to keep it relatively 'pure'. Rules - Wins based, 20 match limit, 6 minutes with 3 stock. No items, no Mii Fighters, no customs. The following stages are included for random picks. But wait, there's more! Over on the Nintendo Life YouTube channel our video man Alex will play with you lovely people in a special Fan Fighter tournament which is just before our 'pro' tournament. The bonus is that taking part could give you a starring role in an episode of the show, plus you can get beaten up by Alex (he's pretty good at Smash Bros.). So, details. To find any of these tournaments, just search by Name or Tourney ID; don't forget you'll need the passwords, too, aside from the password-free Fan Fighter event. So there you have it, plenty to keep you busy. Will you be joining us for some matches? Also, be sure to leave feedback and suggestions for future Tourneys in the comments below. When exactly is he recording, anyways? I'm in! Watch out for Daniel! I'll be sure to join in on the fun! I would have to debate between using Kirby or King Dedede. I'd love to, but alas I have work. The bane of mankind's existence. I might dabble in the For Fun tournament. I don't usually play Smash online. I'm average or lower at best, I feel. @Nintendo_Ninja Sorry, refresh the page, password is there now. I'll make sure to get a few matches going on the For Fun tourney. See you all there! Feel free to beat me up in both! I'll be playing as 'NL~Morgan'! I don't understand why they wouldn't allow us to create 1v1 Tourneys, but I digress. I'll probably join both. Definitely joining this tourney. Probably the only tourney I will be in and rest are regular tournaments. This should be fun! Sadly no 1v1s though, hopefully they patch tournaments for improvements. I joined, let's see how this goes. plan to play in one of those tourney! I love spamming Meta Knight's Down-B! 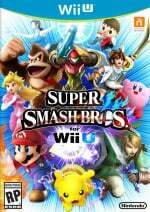 joined the fan fighter tourney! i am so nervous for tomorrow! Okay, I'll join later today. @Mikes you r the meta knight guy who has been destroying everyone! I might get a Wii U in the next couple months, just wish there was some kind of way to link my 3ds Smash to the Wii U version so I don't have to do a ton of random stuff again. I totally want to participate in these type of tourneys. I'll be there dabbling in the For Fun and Fan Fighter ones. Look for me (VictorySong12) I'll be playing either as Dark Pit or Lucina. Probably Lucina a lot. Good luck everyone and have fun! Not that I would do it, but just wondering if people could enter their amiibo in tournets, I haven't seen the name pop up in any of the previous articles? On our way to the pool and we have a soccer tournament tomorrow - real not videoga - so you won't be able to beat on me, I think Reggie could beat me, I don't know upB either. If this becomes a regular occurrence I'll let my kids join in next time. @TeeJay Apologies for that awful performance from me.I got distracted and it chose Captain Falcon for me.I've never used him before haha. @OorWullie Oh haha you were the Captain Falcon I fought against in the Pikmin stage! It's all good. I tried suiciding whenever you accidentally killed yourself to keep things fair. Anyway... I'm having so much fun playing with you guys. If you don't know me, I'm Flames. The Kirby/Duck Hunt/Little Mac/Peach guy. Hope I'm not causing any trouble for you guys! If anyone goes up against a user named Axel, that's me! I'm mostly using Shulk at the moment. @Mr_Rawky I know, right? Luckily I was able to escape it. Thank God for Kirby's multiple jumps! I have the ? name tag. And of course lag...go figure. I'll be in some matches, already faced a few familiar faces. The game I started yesterday is still happening due to lag. No one's mentioning the most important aspect of the new tournament modes: you can now play online with strangers using your Mii fighters. Finally! Definitely doing the for fun one, not sure if I'll be around during fan fighter though. I'll try to make it anyway. @Nintendo_Ninja Everyone's beating me up now, so I can't say that. Am I still the leading player? I had to go study a bit. I guess I've already been knocked down by someone else by now. Back from a break. Nice to see my ranking didn't change too much! A lot of people joined, though. I didn't realize I'm currently in second lol (my mii is Homura btw), I'm gonna take a break since I've been playing for 2 hours straight. @yokokazuo Dang. Well, I'll be back online later. Is it just me, or does search leave a lot to be desired? Maybe an alphabetical sort, or search by title? Well I wish my kid luck, I need a shower after the public pool. This is going to be great fun. I'll participate in these tomorrow once I'm wide awake. @Megumi I dunno, looks like her alright. Cool to see my Yoshi is still alright. If I have time, I'll participate in all of them. Sounds like a great new feature! @Nazo_no_Hikari Oh... so that was you! I was the dark Kirby (Flames). Our matches were awesome, no? @VeeFlamesNL Yeah! I really had fun with you! Mwahaha. Got 2nd in a game with Alex. Man...got second place. I could have had this if the rules were better but hey I had fun! Made an acount just to post here. I"m pretty happy with the player pool thst actually participated. That is i mean the for glory tourney. Just please dont do e stocks with so little time...and get pilot wings outta here. The tourney would have been much more better that way at least. @Newb you got me so many times haha, nicely done! Thanks for all the awesome games everyone!! If you sent a pink Villager flying off the stage, that was probably me! @VeeFlamesNL Haha it's so satisfying! =D Your Kirby was awesome btw! And I laughed out loud when you Rock Kirby'd me from above haha - well played! lol remember your epic self destruct on kongo jungle 64? I almost died watching you try so hard to get back. @Newb You kept winning in my matches! @Newb hahaha yes! not even balloons could save me there, haha - good times! I do a lot 8 player matches with friends so i was well adjusted. @zipmon I remember we were in the Duck Hunt stage. I was in Smash art mode trying to KO you, along with @Jazzer94, but the tree took us by surprise after I hit you. Not always. You gotta know when to get involved. Wiining is mostly done by getting the one guy to fight the others. But yeah link can camp well. I get accused for spamming boomerang but i use it cuz reflecting it doesnt harm link ever. @Gridatttack Haha yeah! That was so lucky! My finest hour today, haha - great games!